Odoo, previously known as OpenERP, is an open source traditional ERP (Enterprise Resource Planning) business apps which also comes with many additional modules that help to manage the tasks such as building e-commerce websites, point of sales (POS), customer relationship management (CRM), quotations, project management, billing, invoicing, accounting, inventory management, purchasing, mailing lists, lead automation, survey, forum, live chat, instant messaging, human resource management including leaves, appraisal and recruitment, business intelligence, and other apps to boost productivity and increase sales. So you want to install Odoo for your company or business? Follow the tutorial to install Odoo 8, the latest version of Odoo on CentOS 7, which should work also in related distributions such as Red Hat Enterprise Linux (RHEL) and Scientific Linux (possibly with slight change in command i.e. systemctl vs service etc). If you have no access to root, use the following commands to set the postgres database user password. Odoo (or OpenERP) depends on Phython runtime and many other packages that are not included in default standard repository. As such, add the Extra Packages for Enterprise Linux (or EPEL) repository support so that Odoo can get whatever dependencies it required. Start the Odoo installation process with the following command. 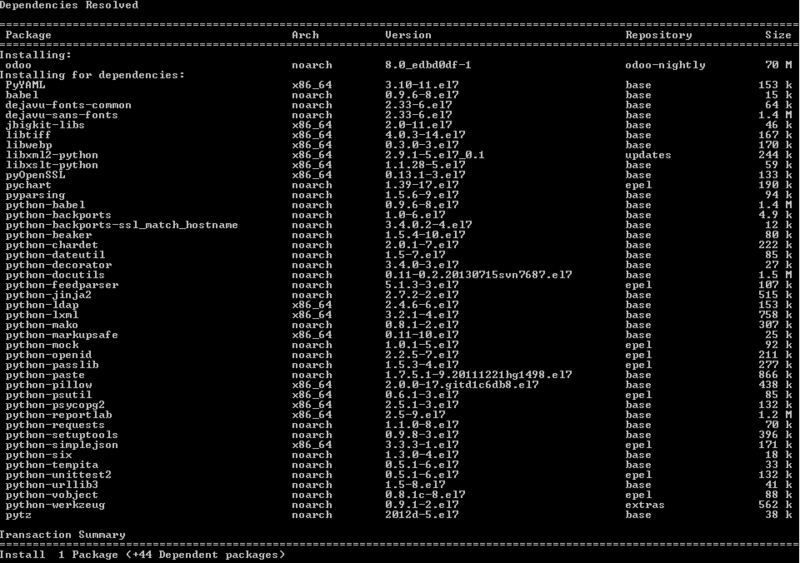 Yum is smart enough to include all required dependencies, including Python packages, at the same time. What the installation did was add a local user account and local group account named “odoo”, which own most Odoo files. By default, the local user account is disabled and locked so that no login is possible, except su from root. 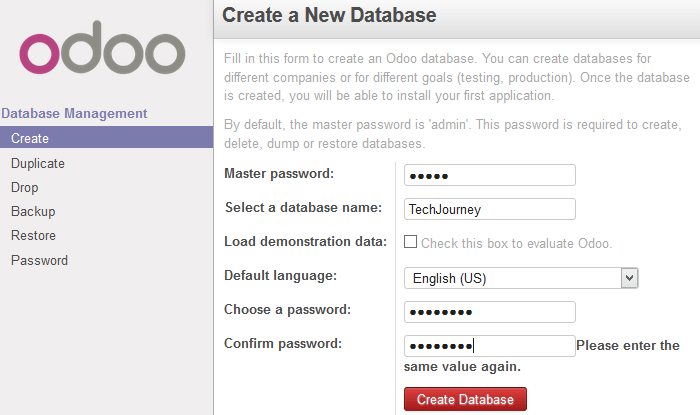 In addition, a user account named “odoo” is also created in PostgreSQL database. Additionally, the Odoo configuration file is created as in /etc/openerp-server.conf or /etc/odoo/openerp-server.conf, which saves the database connection details (No amendment is necessary unless your PostgreSQL DBMS is hosted remotely, has a different port. By default, PostgreSQL allows ident or peer authentication for connection from localhost, which uses client’s operating system user name from kernel or an ident server, and using it as the allowed database user name), and a systemd unit file for Odoo is placed in /usr/lib/systemd/system/odoo.service to allow automatic start of Odoo after server is booted. Odoo 8 is using UTF-8 as character encoding. If you’re not setting UTF-8 as your locale and didn’t specify UTF-8 when initiating PostgreSQL database, chance is PostgreSQL database system and its template0 or template1 standard system databases which new databases are based on may be using SQL_ASCII Latin1 encoding, and Odoo will return an error during its initial setup. Access the Odoo at the URL: http://host-IP-address:8069/. On your first visit, you will arrive at a Database Manager and you need to create a new database and set the password for “admin” account. Once set up, you can log in to the Odoo to install modules and start using the ERP system with user name “admin” and the password you set when creating the database.